Lawyers Abhishek Manu Singhvi and Arun Jaitley and industrialist Vijay Mallya, owner of the now-beleaguered Kingfisher Airlines, are the top three moneymakers among 92 Rajya Sabha members who have declared financial interests in business activities. These range from remunerative directorship of firms, share holding of controlling nature in companies and money from professional engagements. 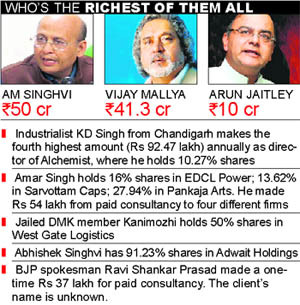 Evaluated for earnings under various business interest categories put together, Lokpal drafting panel chairman Abhishek Manu Singhvi emerged the richest MP. He makes Rs 50 crore a year from law practice. Mallya follows him with annual earnings of Rs 41.3 crore from directorship of 19 companies and shareholdings in 12. Leader of Opposition in the Rajya Sabha, Arun Jaitley, is the third highest moneymaker with annual earnings of Rs 10 crore from law practice. The analysis is based on declarations made by 232 of the 242 Rajya Sabha members under the Register of (pecuniary) Interests to the RS Secretariat. This Register seeks to prevent MPs with conflict of interests from being on related parliamentary committees and participating in related discussions. However, Mallya, with all his interests, is a member of the committee in industry and practicing lawyer Singhvi heads the Standing Committee on Law and Justice. Accessed after two years of struggle by RTI activist Anil Bairwal of the Association of Democratic Reforms (ADR), the register shows that of the 232 MPs who made declarations, 140 said they had nil pecuniary interests. Among them is Congress Andhra member T. Subbarami, who declared assets of Rs 258 crore in the Election Commission affidavit, but nil financial interests to the Rajya Sabha Secretariat. Karan Singh, chairperson of the Rajya Sabha Ethics Committee, which mandated declarations of interests, declared assets of Rs 57.89 crore to the Election Commission but nil pecuniary interests to the Upper House. PM Manmohan Singh also declared nil financial interests to the RS though the stated value of his assets in the EC affidavit stands at Rs 4.3 crore. “Inconsistencies need to be probed. The Income Tax must send review notices to MPs who say they have no pecuniary interests, but actually have huge asset value,” Tarlochan Shastry of ADR said today. The most shocking case is of industrialist Vijay Mallya, an independent member from Karnataka. He may have a case seeking FDI in aviation after his airliner fell into debt, but he is himself very well remunerated. Mallya earns the highest amount -- Rs 39.45 crore -- annually as remuneration for directorship of 19 companies in aviation, pharmaceuticals, liquor, racing, bloodstock breeding and sports. Of this, he gets Rs 33.36 crore for directorship of Kingfisher Airlines alone. Mallya also has the third highest shareholdings of controlling nature among all MPs in 12 companies next only to Congress’ Karnataka and Maharashtra MPs Anil Lad (with shares in Karnataka’s mining businesses, including in Bellary) and Vijay Darda with share holdings in 27 and 21 companies, respectively. The Register of Members’ Interest contains information on their pecuniary interests from six categories: remunerative directorships, shareholding of controlling nature, regular remuneration, paid consultancy and earning from professional engagement. Mallya is the second highest annual earner with Rs 1.85 crore under the regular remunerated activity section, too, next only to nominated MP Shobhana Bhartia with a Rs 2.67 crore annual package from HT Media. Punjab Akali MP Naresh Gujral, with annual remuneration of Rs 4.54 crore from Directorship of Span India and Span Holdings, is the second-highest earner in the category after Mallya. He is also among the top 10 earners from regular activity and makes Rs 25.85 lakh a year from three Gujral Export firms. Vijay Darda has the third highest directorships and makes Rs 2.25 crore annually for being the director of Lokmat Media. Out of the top 10 highest professional earners, six are lawyers. Singhvi and Jaitley lead, followed by BJP’s Ram Jethmalani (Rs 8.41 crore), BSP’s SC Mishra (Rs 3.44 crore), film writer Javed Akhtar (Rs 3 crore) and actor Hema Malini (Rs 2.9 crore). Environment Minister Jayanti Natarajan stands ninth with annual earning of Rs 20 lakh from law practice. The LS Ethics Committee is yet to mandate the Register of Members’ Interest declaration. Even the Rajya Sabha gave the information to ADR on November 3 whereas they had filed a request in July 2009. “It needs to be seen if this information is used to address conflict of interest issues or is just a formality,” Jagdeep Chokkar of ADR said.